Music purists generally tend to favour albums but for me, all it takes is a few minutes of magic to delight - the single is my jam. Hence, why I normally struggle to restrain myself when choosing my favourite tracks of the year - to help things along, this list only includes tracks that have been self-diagnosed/released as singles. 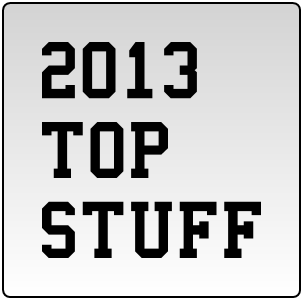 Listen to my thirteen top singles of 2013 in the YouTube playlist below. Seeing as I used to do round ups of my top fifty tracks of the year, this list lacks some singles that I've truly enjoyed - including Mt. Wolf's 'Hypolight' (unfortunately one of their final tracks, splitting at the end of the year), 'The Wire' by HAIM, and The Royal Concept's pulsating 'On Our Way'. Regardless, here's some chat about the ones that did make it. I've enjoyed Ellie Goulding's musical direction over the last year or so, and 'Burn' was a deserved commercial hit. (Pretty much the only one on this list.) Perhaps unsurprisingly, this pop smash had Ryan Tedder as one of its writers - the OneRepublic frontman was responsible for another of 2013's biggest singles, 'Counting Stars'. Kalim Patel unleashed one of the debut singles of the year with 'Magpie', backed by an equally impressive b-side 'Never Never'. The final version of 'Magpie' may have lacked the inspiring rawness of its demo but nonetheless, the galloping chorus yet again proved enrapturing. The lead single from arguably my favourite EP of the year, RAC successfully combined with electro-pop queen MNDR and Kele Okereke from Bloc Party on this finger clickin' good track. Well worth listening to 'We Believe' and 'Tourist' from the 'Don't Talk To' EP also - both are also among my top tracks of 2013. Ghostpoet usually has at least one killer single up his sleeve per album, and he followed 2011's 'Survive It' with this gem, that mixed hip hop with experimental pop. The sublime guest vocals from Woodpecker Wooliams were an unexpected bonus. As is the availability of the track as an official free download, nab it for a limited time below. We wrote about Junior Prom's debut EP back in April, and were pretty surprised that so few other outlets had picked it up. But some important people took note, including Atlantic Records, who released standout EP track 'Sheila Put The Knife Down' later in the year. Sing with me: "We're all fucked up some or other way. Some of us collect, but most of us pay." I don't normally like to feature the same act twice on these type of lists but with Kele again a mere guest vocalist, I figure we'll let this one through. Similarly, the drum and bass vibe is not usually my thing but as with his collab with ALPINES, I'm yet again caught up in the bombastic majesty of it all. "Rappers wear bling cos they want to look pretty." Scroobius Pip is rarely short of a witty quip, and 'Gold Teeth' was no exception. Dan Le Sac was aided by Flux Pavilion in the production department and the result was some of the most gloriously dirty electro we've heard all year. A triumphant return for Yeah Yeah Yeahs came in an unexpected form, with this gospel-infused stormer. Almost oscillating between the fragile and the melodramatic, the finale's choral vocals elevated 'Sacrilege' beyond much of the band's impressive back catalogue. The engrossing Megaforce-directed video matched the track. I honestly doubt I've heard a song as beautiful as 'Avalanche (Slow)' in 2013. A haunting reworking of the original 'Avalanche', with the aid of JG Thirwell and . The vocals were as strikingly incredible as on any other Zola Jesus track but it was the instrumentation that gave the track a transcendent feeling. No longer We Are Augustines, their first song under the new name perhaps eclipsed anything we'd heard previously. (No disrespect to past material, which included the excellent 'Book Of James'.) Adopting some Afro-pop rhythms alongside singalong vocal hooks, 'Cruel City' motored along magnificently. Bit cheeky to set the video in London though, we're alright here. Honestly. When she's not busy working with Radiohead producer Nigel Godrich and Atoms For Peace member Joey Waronker as part of Ultraista, Laura Bettinson is doing a grand job as FEMME. Upon its release, I claimed that 'Heartbeat' was the 'Single Ladies' of 2013 (but with less "uh ohs"), and its sass has hardly diminished since. A prime contender for greatest Los Campesinos! track of their career, the most anthemic and effervescent track they've produced thus far. The move to employ a cheerleading squad for backing vocals/the double chorus was inspired, perhaps by Marilyn Manson's 'mOBSCENE'. Maybe this'll be a shock to some but since I decided to take a punt on 'This Is Gospel' in August, I have come back to the track time and time again. Simply put, a total power-pop anthem. There's a line, in particular, that really connected with me - "they haven't seen the best of us yet". Another fantastic track to be matched with a fantastic video, directed here by Daniel Cloud Campos.